Last week saw the launch of the Global WebVR Hackathon run by Virtuleap, the online platform that is working to take the concept of the hackathon and scale it out for a mass targeted impact on the VR industry. Technology partners like Mozilla, Google, and Microsoft have joined the collective effort to support WebVR as a priority to jumpstarting the industry. “We aim to mobilize the WebVR community and attract talent into coming together to develop new VR based ideas and applications,” says Mohamed Hamdy, co-founder at Virtuleap and co-organizer of the hackathon. What’s more challenging than applying VR to the world of finance? ING Bank has joined the fray with a sponsored challenge that runs in parallel as a special micro-hackathon where teams from around the world are invited to explore the tricky topic of how VR can impact the finance industry. A series of specific challenges will be announced in coming days. 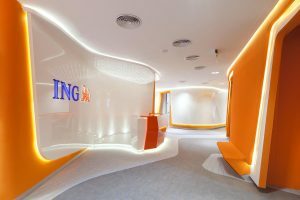 “ING’s strategy is to unlock innovation for our clients through co-creation.” Ivar Wiersma, Head of Innovation at ING Wholesale Banking, told me. “We expect to unlock some of the promise of WebVR for the financial service industry so we can take client experience in banking to the next level. Virtuleap has its faith in the power of graduate and indie teams. Student groups at top-tier schools like Harvard’s VR/AR Club, Stanford’s Rabbit Hole VR, and VR@MIT are officially participating in the hackathon alongside graduate teams at applied research programs like the Entertainment Technology Center at Carnegie Mellon University. Crytek’s VR First program, with its fast growing global academic network, and Sketchfab’s 3D design community are examples of other ecosystem partners that are on board to help widen the developer and designer net and catch as many creative fish as possible. The hackathon runs online for a period of 90-days as teams work to realize their concepts against a release date that affords them the time to collect as many up votes as possible in order to make it as a finalist. The deadline for submission is February 1st, after which a judges’ panel of industry veterans review the top ten concepts and announce the winning teams on February 15th. The panel includes a dozen all-stars in the VR community like Tony Parisi, the VR pioneer who recently joined Unity as their head of AR and VR Strategy, Damon Hernandez, the Founder and Executive Director at AEC Hackathon, and Sean White, SVP of Emerging Technologies at Mozilla. With stakes this big, you need the heavy hitters. Sponsored post by Amir-Esmaeil Bozorgzadeh, the co-founder at Virtuleap, a sandbox for creative developers to showcase their VR concepts to the world. He is also the Amsterdam Chapter Lead at the VR/AR Association and the European Partner at Edoramedia, a games publisher and digital agency with its headquarters in Dubai.